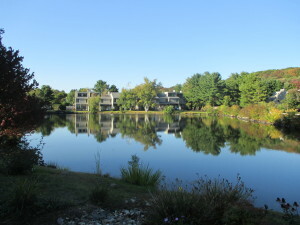 Millpond Condos in North Andover MA is located on Millpond Road which is off of Osgood Street. There are 120 townhouse style condos in this community. These townhouses are right on Stevens pond and are situated on 22 acres, adjacent to 196 acres of walking trails at Weir Hill. The condo fee ranges from $415 – $430 per month and it covers master insurance, swimming pool, exterior maintenance, road maintenance, landscaping, snow removal, refuse removal. Millpond Townhouses consist of 2-3 bedrooms, 1 1/2 – 3 1/2 baths, 1000 – 2200 square feet. Features include serene and tranquil setting overlooking the pond, water views and some units are water front. Patios, balconies, sliders, and central air. Amenities include a clubhouse with pool, two tennis courts and a mail center.